Typical anti-money laundering process can be complicated, difficult, lengthy, highly manual, and prone to false positives. The data required for AML investigations is often complex, highly connected, and can come from multiple data sources within an organisation as well as from external providers. 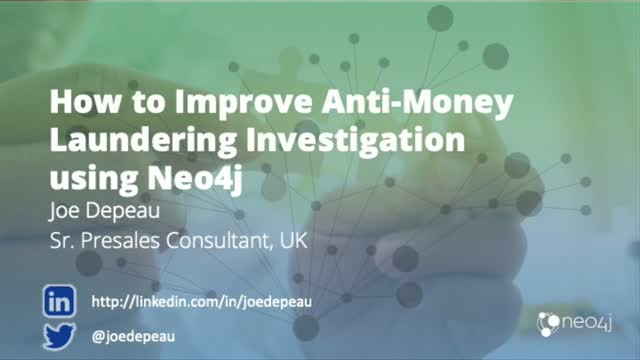 Learn how to use Neo4j and the power of connected data along with graph analytics techniques to improve anti-money laundering investigations and compliance. We’ll demonstrate how Neo4j enables faster and more accurate AML investigations, even across diverse and siloed data landscapes. The POLE data model - Person, Object, Location, Event - is commonly applied to security and investigative use cases such as policing, anti-terrorism, border control, and social services. It’s also a great fit for the graph and graph algorithms. Join us for a demonstration of how Neo4j, graph algorithms, and the POLE data model can support police and social services investigations and generate real-time insights using the Neo4j browser as well as some sample visualisations. In recent years the number and complexity of financial instruments has increased, and continues to grow. The market for these types of products is strong - even though the financial crisis of 2007-2008 highlighted the risks inherent in some complex and opaque financial instruments, and has led to increased regulation of the industry. Join us for a discussion and demonstration of how Neo4j’s powerful graph database technology can be used to easily and effectively model complex financial instruments and help address many of the challenges associated with them: pricing, due diligence, calculating and managing risk, and regulatory compliance and reporting. Today's customers use a combination of channels to interact with a business. Customer Journey Analytics (CJA) is the process of tracking and analyzing every touchpoint that a customer interacts with, across multiple channels and over time. This requires connecting events from multiple sources into customer-centric journeys. Both "connected data points" and "journey analysis" immediately suggest graphs but if we add the need for timeliness (even real-time) and actionable insights there is no doubt about the right technical solution. Find out how to use Neo4j to understand, visualise and influence your customers' journeys, whether that's in the form of recommendations, cause analysis or personalisation to name just a few. In this webinar, Jesús will briefly introduce Graph Databases and then show how can they crucially enhance CJA initiatives with a Telco based example. Real-time recommendations are at the core of digital transformation in any business today. Whether you’re building features such as product, content or promotion recommendations, personalised customer experience, or re-imagining your supply chain to meet growing customer demands, you’re facing challenges that require the ability to leverage connections from many different data sources, in real-time. There’s no better technology to meet these challenges than a native graph database technology such as Neo4j. This webinar will cover the fundamentals of building recommendation engines with a graph database. We will discuss typical architectures, give a demonstration of Neo4j in action, and go over some of our top use cases of recommendation engines for companies such as Walmart, eBay, and more. Fraudsters rely on burying the connections that would expose them below mountains of data to defeat conventional fraud detection technologies. Graph databases can easily uncover those connections, joining the data dots to reveal a pattern of fraud ring activity in real time to catch criminals in the act and prevent losses. Join this webinar for a demonstration of how you can build a fraud detection solution with Neo4j, the leading graph database. Attend this webinar to learn how telcos around the world are using graph databases to achieve competitive advantage. Today’s businesses need to generate real-time, valuable insights from their existing data. In this case, the relationships between data points matter more than the individual points themselves. Industry leads are turning to graph databases which treat those valuable relationships (connections) as first-class entities. Neo4j is the world's leading graph database, with native graph storage and processing.